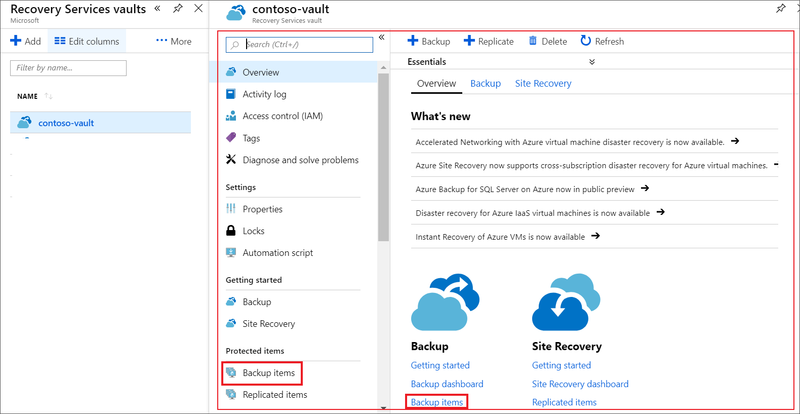 This article describes how to manage Azure virtual machines (VMs) that are backed up by using the Azure Backup service. The article also summarizes the backup information you can find on the vault dashboard. The latest backup, which is also the latest restore point. The total size of all backup snapshots. The number of VMs that are enabled for backups. You can manage backups by using the dashboard and by drilling down to individual VMs. To begin machine backups, open the vault on the dashboard. On the Hub menu, select Browse. In the list of resources, type Recovery Services. As you type, the list is filtered based on your input. Select Recovery Services vaults. For ease of use, right-click the vault and select Pin to dashboard. On the Backup Items tile, select Azure Virtual Machines. On the Backup Items blade, you can view the list of protected VMs. In this example, the vault protects one virtual machine: demobackup. From the vault item's dashboard, modify backup policies, run an on-demand backup, stop or resume protection of VMs, delete backup data, view restore points, and run a restore. Sign in to the Azure portal. Open the vault dashboard. On the Backup Items blade, you can view the list of protected VMs and last backup status with latest restore points time. From the vault item's dashboard, you can select a backup policy. To switch policies, select a different policy and then select Save. The new policy is immediately applied to the vault. If the initial backup is pending, on-demand backup creates a full copy of the VM in the Recovery Services vault. If the initial backup is complete, an on-demand backup will only send changes from the previous snapshot to the Recovery Services vault. That is, later backups are always incremental. The retention range for an on-demand backup is the retention value that you specify when you trigger the backup. On the vault item dashboard, under Protected Item, select Backup Item. From Backup Management Type, select Azure Virtual Machine. The Backup Item (Azure Virtual Machine) blade appears. 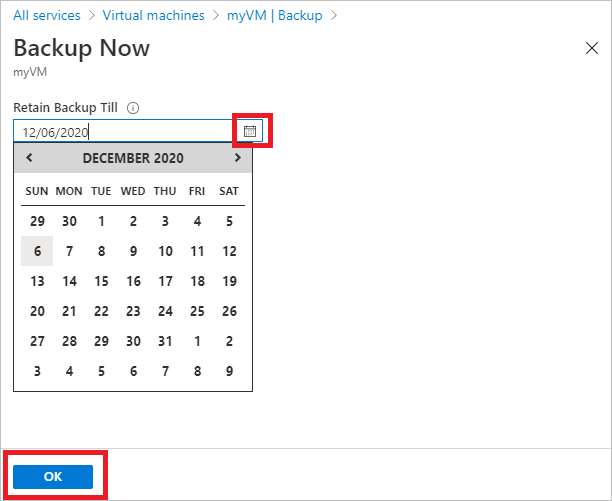 Select a VM and select Backup Now to create an on-demand backup. The Backup Now blade appears. In the Retain Backup Till field, specify a date for the backup to be retained. Select OK to run the backup job. To track the job's progress, on the vault dashboard, select the Backup Jobs tile. Stop all future backup jobs and delete all recovery points. In this case, you won't be able to restore the VM. Stop all future backup jobs and keep the recovery points. Although you'll need to pay to keep the recovery points in the vault, you'll be able to restore the VM if needed. For more information, see Azure Backup pricing. If you delete a data source without stopping backups, new backups will fail. Old recovery points will expire according to the policy, but one last recovery point will always be kept until you stop the backups and delete the data. On the vault item's dashboard, select Stop backup. Choose whether to retain or delete the backup data, and confirm your selection as needed. Add a comment if you want. If you aren't sure of the item's name, hover over the exclamation mark to view the name. A notification lets you know that the backup jobs have been stopped. If you keep backup data when you stop the VM, you can later resume protection. If you delete the backup data, you can't resume protection. On the vault item's dashboard, select Resume backup. 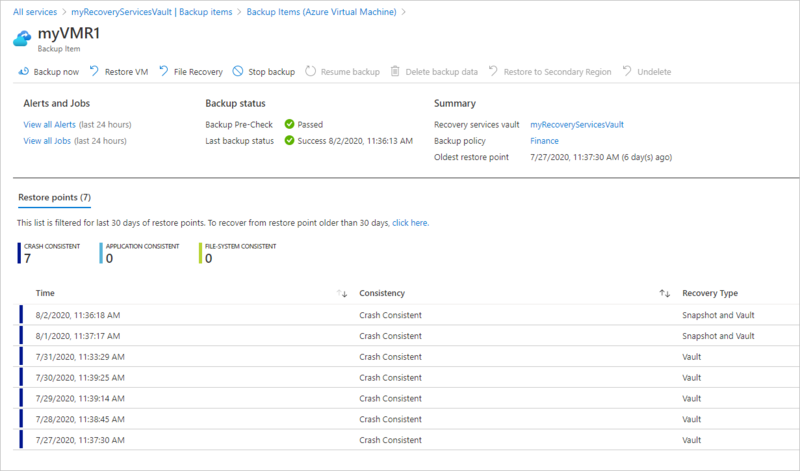 Follow the steps in Manage backup policies to assign the policy for the VM. You don't need to choose the VM's initial protection policy. It might be a good idea to wait days or weeks before you delete the recovery points. Unlike the process for restoring recovery points, when you delete backup data, you can't choose specific recovery points to delete. If you delete your backup data, you delete all associated recovery points. On the vault item dashboard, select Delete backup data. Type the name of the backup item to confirm that you want to delete the recovery points. To delete the backup data for the item, select Delete. A notification message lets you know that the backup data has been deleted. 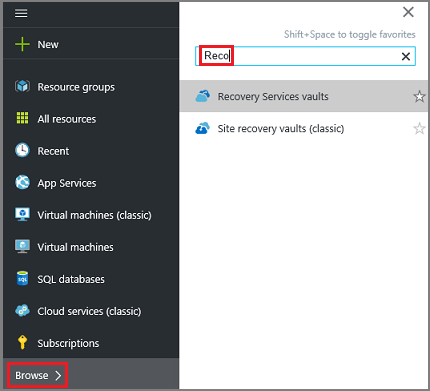 Learn how to back up Azure VMs from the VM's settings. Learn how to restore VMs. Learn how to monitor Azure VM backups.